Pirate's Inn enjoys a fabulous location in Hastings, which is appreciated by families, couples and group of friends. 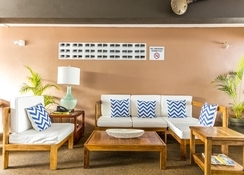 As it is very close to the Caribbean Sea, both beach lovers and water sport enthusiasts will find the hotel appealing. The outdoor swimming pool is stunningly set amid palm trees, where you can take a relaxing swim under the sun and also have refreshing drinks from the bar. 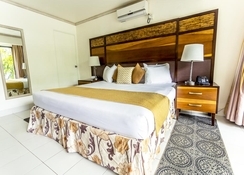 The rooms in the hotel are attractively set and they are available in numerous categories to match the needs of couples, families and friends. Foodies will also have a nice time at the hotel’s in-house restaurant and there is a bar too, which is open from 6pm to 9pm. 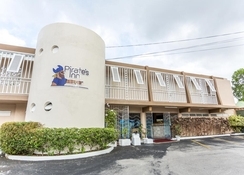 Pirate's Inn is conveniently nestled in Brown's Gap, Bridgetown, Barbados. 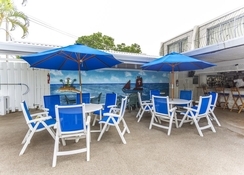 It is within 5km from numerous shops, restaurants and a couple of famous beaches in Bridgetown. Other attractions close to the hotel include Needhams Point (1.6km) and Garrison Savannah, which is a mere 5 minutes’ drive away. 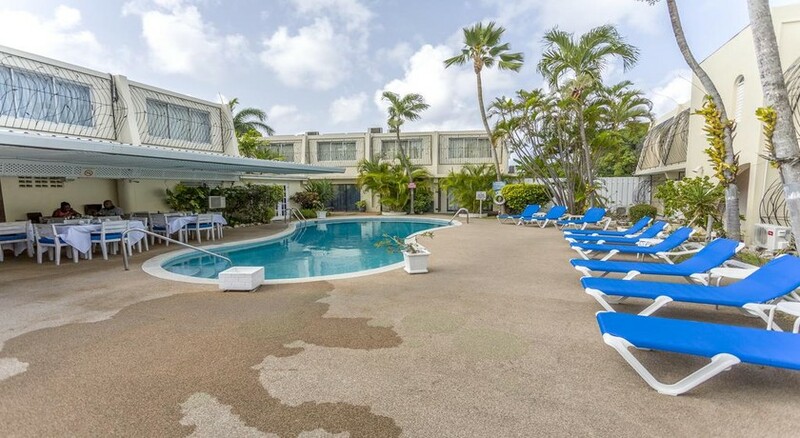 The Accra Beach is a mere 3-minute walk away, making it convenient for beach lovers. The Grantley Adams International Airport is only 14.1km away, making it convenient for the guests to board their flights on time. The hotel has air-conditioned rooms with modern furnishing designed to lure all kinds of guests. 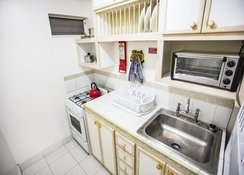 Rooms are available in the following categories: Standard Studio Apartment, Studio with Patio and Studio with Balcony. They come with all the essential amenities, including flat screen TV, telephone, king-sized or 2 single beds, safety locker, alarm clock, hairdryer, coffee maker, alarm clock, hairdryer, coffee maker, iron and ironing table and in-room service. 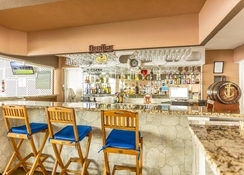 The hotel offers ample dining and drinking facilities in its in-house restaurant and bar. The restaurant serves lip-smacking breakfast and snacks from 7:30am to 12 noon on the other hand the bar is open from 6pm to 9pm. If you want to explore more foods then head to then step into one of these restaurants namely Tagores Kebabs and Curries, Salt Café and Ackee Tree Restaurant. As a guest, you will find plenty of sports and leisure facilities in and around the hotel, which will make your stay even more exciting. There is an outdoor swimming pool, where the guests can take a relaxing swim in the water and at the same time soak up the sun. There are many sun loungers dotted across the pool, where the guests can have refreshing drinks.